In Jerzy Kawalerowicz’s Mother Joan of the Angels, the director places his camera in the figurative and literal position of God. In this Cannes-winning title from 1961, Kawalerowicz’s stunning, evocative images made of starkly contrasted black and whites – in a nicely twisted spin on the old black = evil, white = good cliche of symbolism – takes on the POV of a divine entity, suggesting a directorial statement that places the physical camera above all. In the 110 minutes of this arresting film, Kawalerowicz and his collaborators certainly worship the camera, making for one of the most visually ravishing films I can recall. It’s perhaps an easy stretch to make when the film itself deals with the fracturing realities of religion and, perhaps even more importantly, faith. Kawalerowicz’s film follows a priest on his mission to a convent that is believed to have come under the possession of a demon, with his (both the priest and the demon/s’) attentions focused most intently on that of Mother Joan, the leader of the convent and the one believed to be the most possessed of all. Questions of whether the nuns are possessed at all are raised by the film, as if its characters are attempting to reveal their lying sins to the camera/God by performing acts of so-called possession that could be explained away by simply physics or logic, and many of Kawalerowicz’s recurring visual motifs give the illusion of a God-like presence. Picking up blissfully quick after the opening credits, the action begins with the newly-arrived Father Suryn goes to enter the convent’s thick, ominously daunting walls. It’s at this moment where the camera truly takes upon a life of its own, entering the confines of the nun’s world not through the Earth-bound eyes of the priest, but rather by floating in like a majestic, spiritual being. The camera glides in through a beautiful tracking shot that, despite the initial belief that it is through Father Suryn’s POV, moves in a way that is wholly otherworldly. It’s a small moment, but one that suggests the audience shouldn’t assume that the action is being viewed simply through the eyes of the priest, but rather the omnipotent presence that hangs over the film’s middle-of-nowhere location like a heavy fog. Throughout the rest of the film, characters routinely shy away from the camera with their backs turned as if scared to look directly out at the world through the lens. Mother Joan especially, and later on Father Suryn himself, shield their faces from the camera’s field of vision, as if the demon inside them is unable to look directly at the face of God without revealing their true selves. Almost every moment of close-up corresponds with the emergence of the demonic spirit within. The priest’s first meeting with Mother Joan in the convent dining hall is particularly noticeable for this as she eventually glares down the middle of the lens and shows God/the audience/Father Suryn what she really is before pulling a (very literal) slight of hand. Another character, Sister Malgorzata, is one of obviously questionable faith and is shown repeating running away from the convent towards the camera as if desperately trying to find the God that she sees has deserted her fellow sisters. By film’s end, once she has committed a sin that she eventually realises is perhaps worse than anything the Satanic demons of the convent could have made her do, she is finally seen running away. Running away from God to hide her shame. 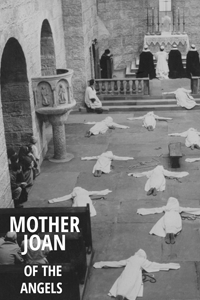 The imagery in Mother Joan of the Angels is full if robust symbolism and beautiful, if increasingly more complex and sinister, compositions. Even when the film threatens to enter camp, what with its convent of nuns doing wacky things including but not confined to hissing at the camera, shrieking upon being sprayed with holy water, and tumbling around on the floor like petulant children, it reconfigures itself into something more menacing thanks to a simple change of angle or a transforming, sting of a barb. Lucyna Winnicka as Mother Joan is particularly spectacular at these moments, turning her head or peeling away her habit to reveal a look or sling a Satanic verse that returns the action to its rightfully disturbing place. Kawalerowicz is making a defining statement with the way he has shot Mother Joan of the Angels. By allowing the lens to act as the eye of God, he opens up the film from being a standard work of witchy horror, and rather allows it to become a statement about filmmakers, filmmaking, and the way art can capture things that could go otherwise unseen by the world and each other. Furthermore, what if characters in film were presented so plainly and cleanly with the face of God; what would it reveal? The vitality of its imagery and the immediacy of its actions suggest a director who seeks a more powerful truth even in a folly as potentially silly as possessed nuns, allowing it to take on a bigger, bolder, grander importance. By making his camera a very literal God for its characters to react to, Kawalerowicz reveals their inner demons just as well as their outer ones (like, for instance, the mental fragility of Father Suryn coupled with the physical weakness of his body as demonstrated early on by the sliver of bread he allows himself to eat). The director’s camera is looking upon these characters and allowing them to reveal everything, even if they don’t want to. There’s nowhere to hide for them as they’re confronted with the potential hypocrisy of their sins in the real world as opposed to a mystical one after death.